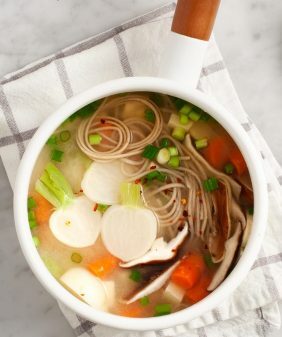 I love this healing soba noodle soup on winter weeknights. It takes 30 minutes to make, but ginger, mushrooms & tamari give it depth of flavor. 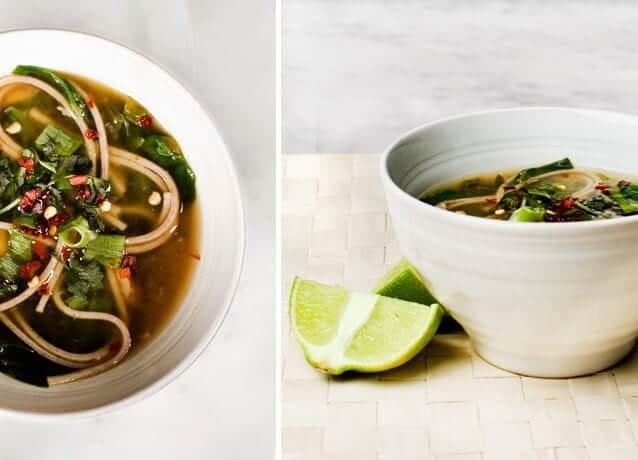 This soba noodle soup comes together in a snap, but it’s deeply flavorful, so it’s just the thing for a cold weeknight. Lately, I’ve been adding wakame flakes to it for a sea vegetable health boost. They come dehydrated in the Asian aisle of most higher end grocery stores. Beware, when the package says, “one teaspoon equals one serving… will expand over 20 times,” they really meant it. The first time I tried these I was sure that was a misprint and I tossed in a heaping handful or two and had cups upon cups of rehydrated sea greens. 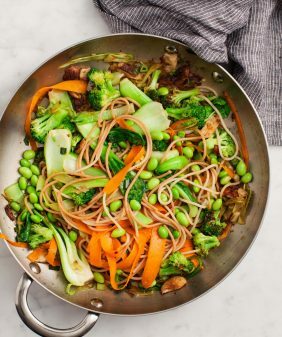 If you love soba noodles, check out this citrus noodle bowl or these sesame shiitake noodles next! 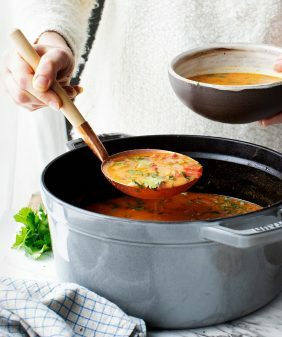 And for more soup ideas, look here. This easy, 30-minute soba noodle soup is a great choice for weeknights. Vegan & gluten-free, it's delicious with wakame flakes, spicy sriracha, and fresh cilantro. In a medium-large pot, heat the oil over medium heat. Add the mushrooms, white scallion slices, garlic, and ginger. Season with salt. Sauté, stirring occasionally, until mushrooms are tender, 6-7 minutes. Add the vegetable broth and three cups water and bring to a boil. Add the noodles and reduce to a simmer. Add the spinach and wakame flakes and cook until the spinach is just wilted (but still vibrant green) and the wakame is rehydrated (it rehydrates fast). Add the lime juice, tamari, and a drizzle of sesame oil. Taste and adjust seasonings if necessary. Top with scallion greens, red pepper flakes or sriracha, and cilantro (if using). 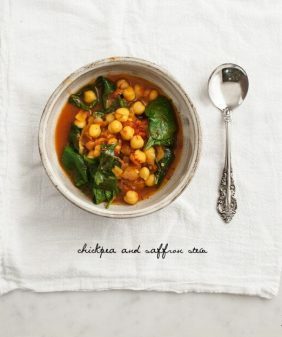 Your picture of this soup totally drew me in – it seems like the perfect meal for a cold winter night. I’ve never heard of wakame flakes but I’ll be looking for them the next time I’m at the Asian grocery store. thank you! 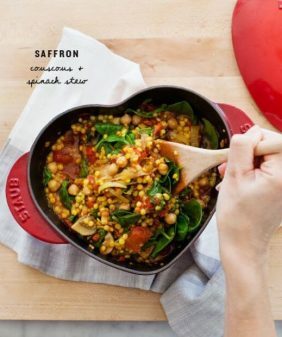 I love your blog and your (especially vegan) recipes and I want to visit hawaii so badly! Found your site via Glamour.com! Love it!!! This recipe sounds amazing and I’ll definitely be making it. I’ll also definitely be following your gorgeous site. Can’t wait to gather more amazing recipes! 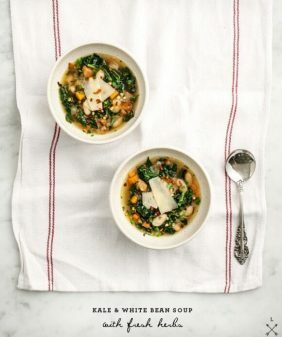 So excited to make this soup! Looks delicious but also so nutritious. My dad just started chemotherapy and he needs lots of nutrition for his depleted body. One of the suggestions was wakame for it’s incredible health benefits. His chemo leaves him cold to the bone so a warm soup filled with goodness is just what he needs!! Keep it up! This sounds wonderful. My family has been on a soba noodle/ soup kick lately and this is so nutritious as well. Thank you! Oh, happened upon your site by way of Pinterest! Beautiful, welcoming, can’t wait to try some of these recipes! Just made this tonight – biggest changes being I did not use seaweed, and used chives from my garden instead of mushrooms. It was delicious! A hard-boiled egg goes great in here for the omnivores. I made this tonight and am now in love. the sriracha is the magic ingredient. Delicious! Definitely making this, this weekend. YUM!!! !